The elaborate Neo-Byzantine Cathedrale de la Mayor on the West side of Marseille, Bouches du Rhone, France. Cathedrale de la Mayor, Church in downtown Marseille, Bouches du Rhone, Cote Bleue, Blue Coast, Mediterranean, Provence, France, Europe. 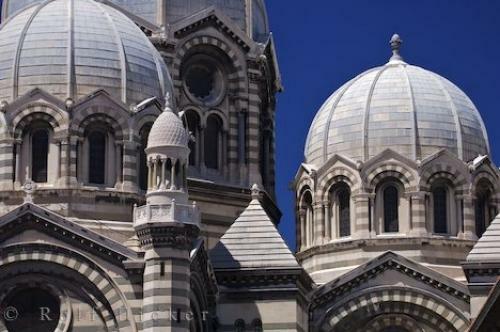 Photo of the domes of the Cathedrale de la Mayor in the city of Marseille, Cote Bleue, France.